Perhaps we were foolish to get our hopes up about Thundercats. It is a licensed game, after all, and while that's not a universally bad thing, it should by this point at least make us think twice. Then again, it's Thundercats! The original cartoon is an enduring classic, the recent reboot was surprisingly good, and the screenshots for this game suggested a colourful comic-book approach to what should have been some easily adaptable material. We looked forward to it. We hoped for the best. We just wanted some simple fun. Oh boy were we suckered. Thundercats is a bad game. 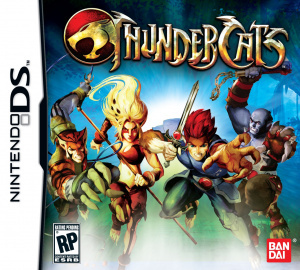 In every review on Nintendo Life we try to highlight both the positive and negative aspects of the title under scrutiny, but releases like Thundercats truly strain our ability to do so. It's playable, and the art style is nice, but beyond that we've got nothing. The game's plot is a simple — and ever changing — rotation of contrivances designed exclusively to throw hordes of identical enemies your way, and that's fine. We like a good, simple beat-em-up as much as anyone. But there's a difference between a good, simple beat-em-up and a mindless button masher, and Thundercats is blissfully unaware of that difference. 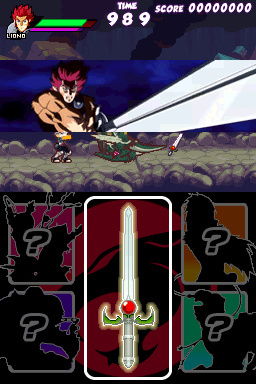 You take control of Lion-O, who is armed with the Sword of Omens. He can double jump and swing his sword, but don't expect him to be capable of much more. In fact, don't expect him to be capable of even that much, as he takes an irritatingly long time to react to your button presses, as though he's trying to remember what he's supposed to do when you press B. There are some minor attempts at variety along the way — such as giving Lion-O a Zelda II style downward thrust, or leveling his weapon up a couple of notches like the whip in Castlevania — but that's about it. Every level is a tedious slap-fight that culminates in a boss battle so long and dull you'll mainly be fighting the game's unnerving ability to put you to sleep. The enemies change from level to level, but within levels there's almost nothing in the way of variety. Some have ranged attacks and some walk back and forth brainlessly until you kill them, but the idea is always the same: beat up dozens and dozens of them so that the game will advance and let you beat up dozens and dozens more. There's no room for strategising and you'd be punished if you tried anyway; Lion-O reacts so slowly and the enemies gang up so quickly that the only way out is to press the attack button as fast as you can and wait for it to end. That's the approach you'll be using all throughout the game, and it gets old fast. The ranged enemies are particularly annoying because Lion-O both stuns easily and takes forever to stand up again once he takes damage. This means that a stream of projectiles can essentially lock him in place, and you have to wait patiently until the barrage stops and the game decides to let you finally move him again. It also takes ages to defeat even the weakest enemies. We don't know what kind of metal the Sword of Omens is made of, but in battle it feels like you'd be better off with a fistful of uncooked spaghetti noodles. It gets even worse when it's time to face a boss, as no health meter is displayed and it takes forever to wear them down. They aren't overly difficult — most of them repeat the same basic patterns over and over again — but they take an absurdly long time to defeat, simply due to how weak Lion-O is, and you never have any idea how far away you are from beating them. 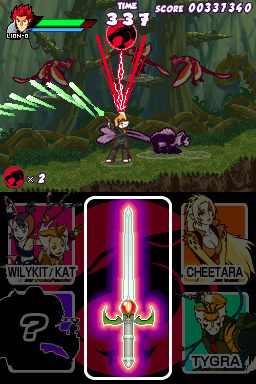 Also irritating is Lion-O's tendency to slip forward whenever he swings his sword. As you might imagine, this makes fighting on small platforms an absolute nightmare. It can take ten or more hits to defeat an enemy, and every time you hit them you move forward slightly. If you don't keep correcting your footing, Lion-O can, and often will, tumble to his doom. This is especially awful in boss fights, in which you may only have time to land a couple of hits during their vulnerability period. Any more and you won't have time to reset Lion-O's footing, and he'll fall from where he needs to be in order to deal damage. You might think the game would account for this by making those bosses take fewer hits to kill, but you'd be mistaken. 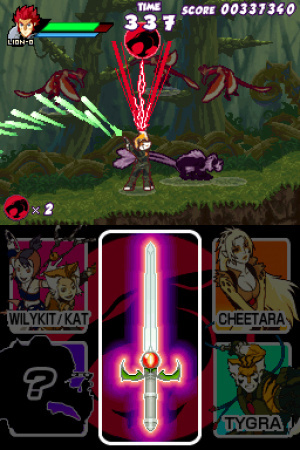 As you land hits you will charge up a meter that, when full, allows you to unleash the true power of the Sword of Omens: a red energy blast that looks far more impressive than it really is, as most enemies just blink at you in disbelief when struck with it. 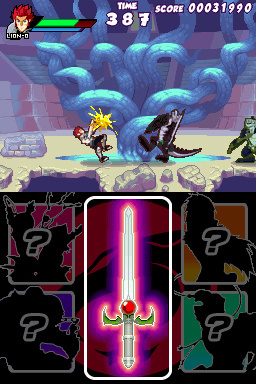 You activate this blast by tapping the center of the bottom screen. You can also tap one of four helper characters that you unlock along the way, each of which shows up, does a little dance, and leaves both you and the enemies baffled by whatever just happened. Visually, at least, the game looks nice, but it animates terribly. Movement is jerky and the cut scenes don't move at all; they're still images with text that assures you that some really awesome stuff is happening...you just can't see it. As if to tease you, entire plots are literally set up and resolved in these cut scenes without your involvement, and by the time you get control of Lion-O again you're just mashing your way through relentless clone armies again. The audio is also pretty terrible, as you're guaranteed to mute your system after the 37th time you hear "Thundercats, hoooo! ", which will be around three or four minutes into the game, max. Let's not mince words: Thundercats is a terrible game. It's playable alright, but that's sincerely the nicest thing we can say about it. It's a stiff, awkward slog of an experience that somehow manages to feel repetitive from the very first screen. There's no room for strategising, the enemies and bosses take far too long to defeat, and the best parts of the game happen off-camera. Thundercats is about as bad as a game can get while still remaining functional. This one belongs in the litterbox. Meh, I didn't like the show either. At least you guys didn't give it a 1. I seriously had hoped that this game would be good. It's basically the excellent show's last effort to get renewed. Good thing I didn't pre-ordered this game. Was going to though. I might pick it up once it's in the bargain bin. Besides that trailer is only like 10 seconds of footage. Wow, I'm not sure what's worse, The game itself, or the fact that I'm still gonna pick up a copy. This review's title...that's similar to what Nintendo Power used. Not that I'm complaining, I just find it funny. I hadn't even heard of this game until today. I was a huge fan of the Thundercats back in the 80's (still have a bunch of the figures tucked away in storage) and I enjoyed the new version. I saw this game when I went to Target the other day to pick up WWE 13 and was tempted to pick it up. Glad I didnt. Actually, that's exactly what Nintendo Power said. Great minds think alike, eh Chicken? Didn't see that coming. Oh wait, yes I did. Why was anything ever expected from this game? The same goes for the upcoming Adventure Time game. People need to realize that said games are just shovelware. People need to realize that said games are just shovelware. Definitely the right mindset for a review site to have. The trailer made it look decent, oh well. What a disappointment. I was really hoping for the best with this one. I didn't expect it to be good, because cartoon-based games always fail. Sad. I'd still wish Sym-Bionic Titan and Flapjack (horror game for kids) got games. A shame, the reboot is much better than the original series IMO. Oh well. The show is getting a 2nd chance on Adult Swim's revived Toonami block it appears, and it looks like it's doing respectfully there (they recently moved it up an hour in the schedule). I hadn't even heard of this reboot. Aw, that's disappointing. The new show is pretty good and I thought this could be good as well. Is this a GBA port ? I was thinking about getting the game since I love the show and I recently been seeing re runs of it in Cartoonnetwork. But I guess I will not be getting the now. I liked the new Thundercats show, but I was afraid of this. Good to know I can just forget this game exists. I don't know why you guys had hopes for this one. 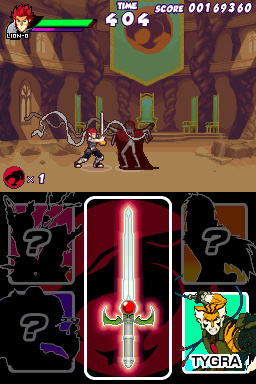 It was pretty clear from the beggining it was going to be just like those Power Rangers GBA games. I mean, I loved the show too, and I don't think all licensed games are bad, but this one had "generic button masher" written all over it. Heck, I think that's the exact same expression I used when I saw a preview of it, maybe on this site or another one.